Engagement is a truly magical time ~ from the moment your sweetheart pops that special question until you two celebrate your wedding day with family and friends. After the proposal ~ and with all of the romance aside ~ it's also the beginning of the process that brings you and your fiancé hundreds of details and arrangements to be made ~ like choosing your wedding invitations. Every couple wants something beautiful ~ and these are easy to find online and at your local stationery shop, but if you'd like something truly unique and completely personal, I may be a good fit for you. As a professional graphic designer and art director with decades of experience, I can create nearly any type of invitation to suit your taste. See the sample packet of coordinated items below in "The Invitation Process." 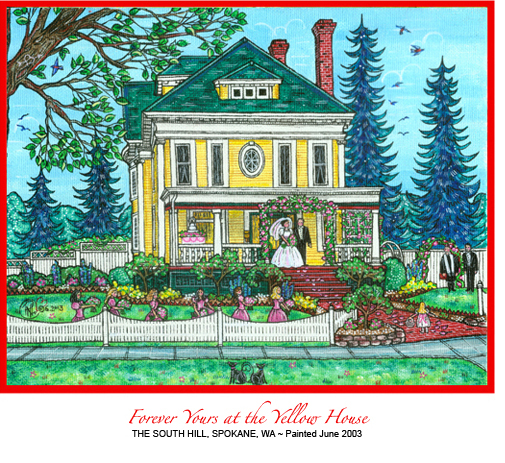 My specialty however is one-of-a-kind invitations featuring your commissioned fine artwork. 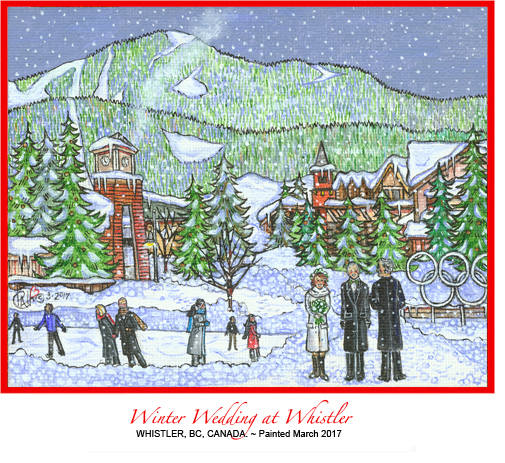 I complete your wedding portrait long before the event to use as cover art for invitations and other collateral materials. 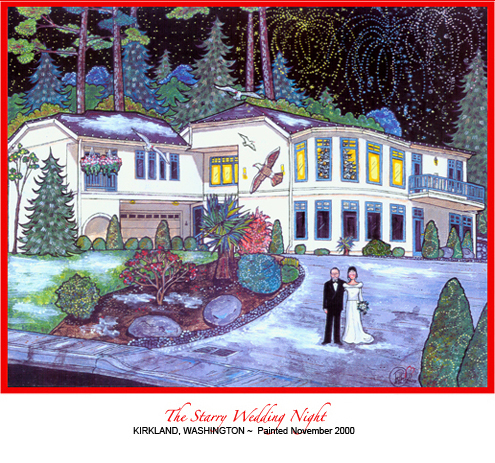 The artwork is so personal that many clients feel it rivals photography as the truly perfect memento of your special day. We plan a meeting at my studio to work out most of the details of your order. 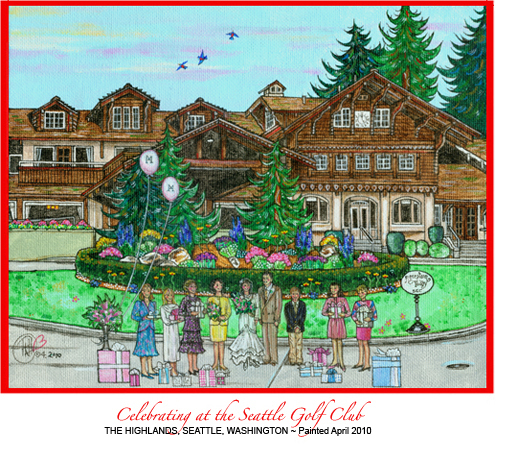 I will share samples of work I've completed for other clients and as well as images of fine art portraits I've painted. I've shared my wedding portrait to the left and you'll find 10 more images further downthis page. 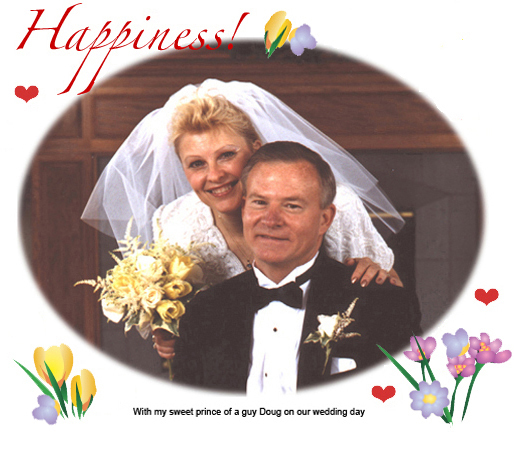 You may have found a wedding invitation or two with a look and feel that really speaks to you ~ and this meeting is a great time to share these with me. YOUR HUSBAND TO BE ~ If you bring your fiancé with you to the meeting ~ and you're a stickler for tradition ~ this will bring up the dilemma of him seeing your wedding gown before your special day. You may wish to handle the creation of your artwork without him and give the painting to him as a wedding gift. A little planning on your part plus the cooperation of friends and family can be a big help here. At this time, we'll also discuss quantity, your timeframe for completion and all of the collateral items you would like to have created for your special event. AM I THE BEST DESIGNER FOR YOU ? ~ Since my all of my work is completely custom and much of it hand-made, huge orders (200+) may not make me the best fit for you. We can look at your needs and expectations at this initial meeting ~ and make a decision whether or not to move forward. Any other special details like a garden, arbor, vintage car, horse-drawn carriage, etc. The size of the painting (8x10-inch or 11x14-inch) and color palette. NOTE ~ I use these two sizes as they are "standard," eliminating the need for custom framing. An estimation of the length of time it will take me to complete your artwork which helps determine my fee. ESTIMATING THE FEE, THE CREATIVE PROCESS & DELIVERY OF YOUR "MASTERPIECE"
The formula is simple ~ I charge by the number of hours I estimate it will take me to complete the painting using all the information gathered in the complimentary planning process. We'll sign an agreement and I'll receive your deposit of 50% of the total amount. The balance (50% plus any additional incurred expenses by changes or additions to the piece) is due upon your receipt of the finished artwork. At that time, sales tax for the entire amount will also be due. Note ~ I accept Visa, MasterCard, Discover and American Express. As your artwork progresses, sometime we schedule a second consultation in person or view thumbnails of your commission while chatting via Facetime of by viewing pdfs to make certain that we have all the details correct. When your "masterpiece" is finished, the total balance is due (plus tax). As my gift to you (unless you wish to handle this yourself), I have your painting framed. 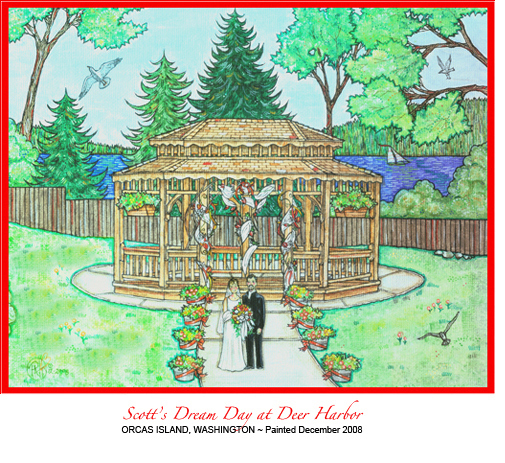 I also include an acid-free matted, signed print or a handful of art cards featuring your wedding image. 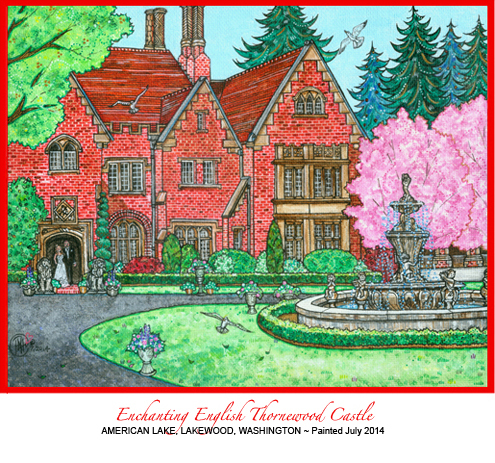 You may also wish to order prints on fine paper, canvas or cards for members of your wedding party or family. 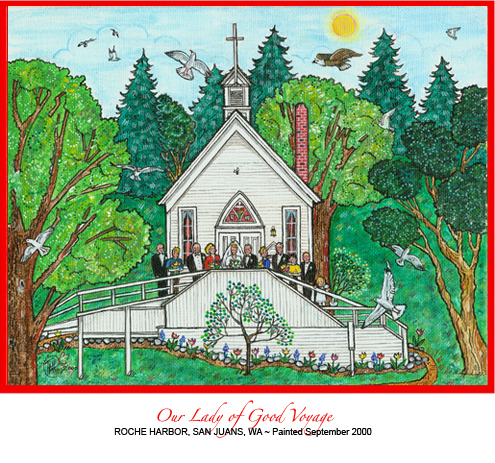 Here's a sampling of a ten different wedding portraits I've completed over the years ~ most of these commissioned by clients. CREATIVE TEXT ~ Click on the invitation to the right or on Wedding Invitation pdf to see a collection of sample coordinated wedding items. Other items like bridal shower, thank you, gift enclosure tags for your wedding party gifts, special hang-tags for bubble bottles (instead of rice or confetti for when the couple departs, champagne/wine bottle labels and more! By now, you and your fiancé have chosen the text for the inside of your invitations. I'll mock up a sample invitation with the cover art or whatever you wish. You may consider adding ribbon, scalloped edges, tone-on-tone vellum paper ~ whatever creates your perfect look. Once we've agreed upon the design, I'll design the R.S.V.P. You may also consider having R.S.V.P.s for your rehearsal dinner, as well as tuck-in maps for the rehearsal dinner, ceremony and/or the reception. 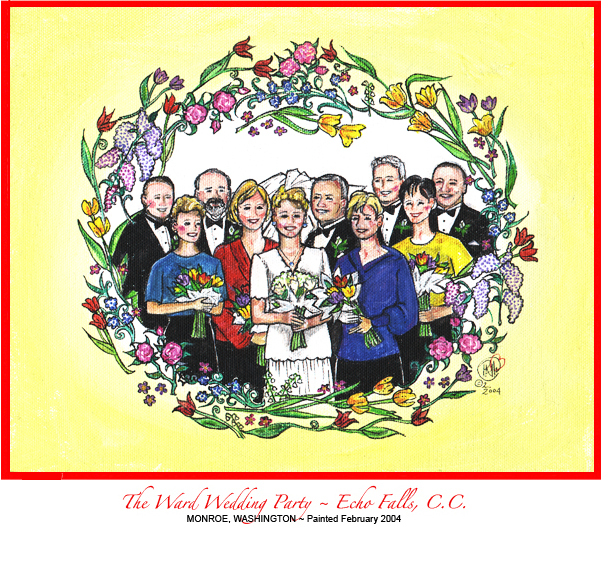 FAMILY & WEDDING PARTY ~ An invitation packet for family and members of your wedding party typically includes seven items ~ an invitation, two R.S.V.P. cards (for the wedding and for the rehearsal dinner), their envelopes, ceremony program, plus a map to the ceremony and/or reception. 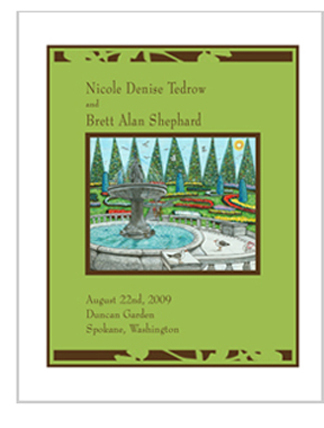 GUESTS ~ A wedding invitation packet for guests typically includes six items ~ an invitation and R.S.V.P. 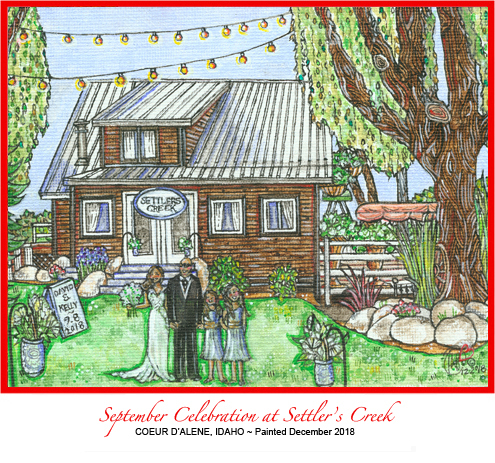 card, their envelopes, ceremony program, plus a map to the ceremony and/or reception. 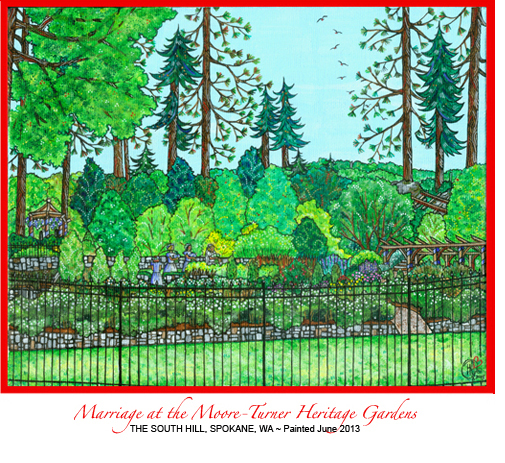 Highlight ~ The program cover pictured here contains design elements of invitations created by another designer, but includes my painting of the couple's ceremony setting, Duncan Garden in Spokane's Manito Park. This gave the bride the best of both worlds by combining elements. 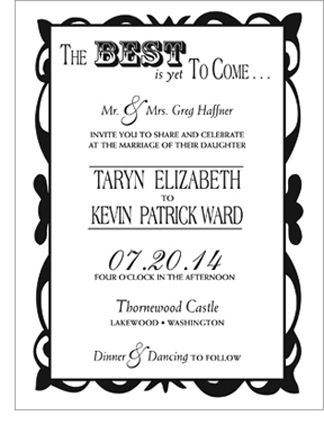 Invitations should be mailed two months prior to your event ~ even for small family affairs. You want ALL of your loved ones around you, so it's best to give everyone plenty of notice. Consider carefully any other items you would like to order, such as personalized thank you notes, programs, shower invitations, etc. Once you've made your selections, we'll sign a contract. I'll estimate the cost, as well as a completion date and receive an estimated 50% deposit. Within ten days, you will sign off on all the mock-ups of what you have ordered. NOTE ~ I am not responsible for ANY typographical or content errors. When you collect your finished invitations and collateral materials, you'll pay your remaining balance plus sales tax. If you wish to order other items, such as customized thank you notes, etc. we'll renegotiate the fee to include the extras. 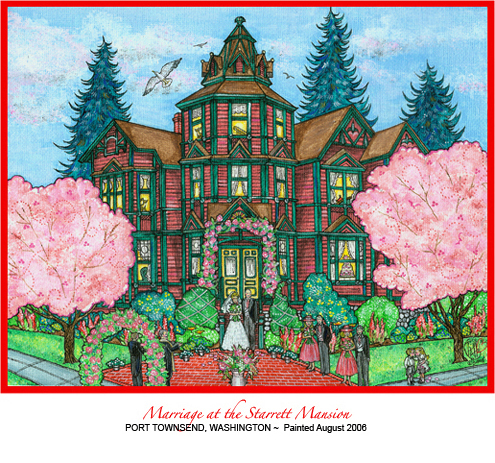 If you've commissioned a wedding portrait for your invitations, you and your new husband will be the proud owners of a personal memento of the most important day of your lives. Plus your friends and family will have the special image of it as well.